Recommended Citation: Bekkering, E, D Hutchison, and L A Werner. A Follow-up Study of Detecting Phishing Emails. In The Proceedings of the Conference on Information Systems Applied Research 2009, v 2 (Washington DC): §2366. ISSN: 0000-0000. Phishing continues to be an ongoing threat to online security. 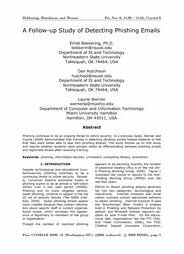 In a previous study, Werner and Courte (2008) demonstrated that training in detecting phishing emails helped students to feel that they were better able to deal with phishing attacks. This study follows up on that study and reports whether students were actually better at differentiating between phishing emails and legitimate emails after receiving training.